Introducing the all new AMP Series. The AMP Series builds on the foundation of our groundbreaking HBC Series. 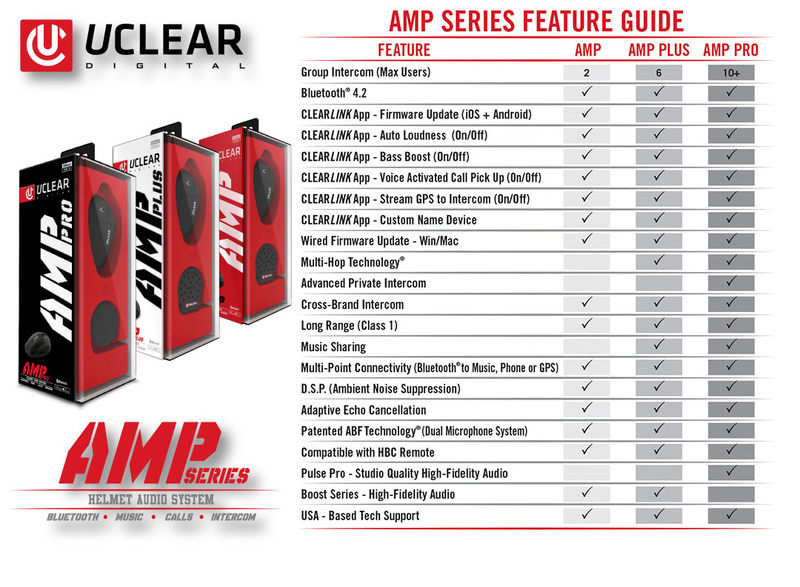 With three models to choose from, AMP, AMP Plus, and AMP Pro, the Series features something for everyone. The AMP processor is faster and more powerful than anything else on the market and uses advanced Bluetooth 4.2 connectivity for a stronger and more stable connection. Paired with our hi-definition speaker systems, Boost Plus, Boost Pro, or the industry-leading Pulse Pro, the AMP Series is redefining helmet audio. As an added bonus, every unit includes access to our innovative CLEARLink app. The industry-first mobile app updates firmware wirelessly from your smartphone or tablet, and also includes additional tools to easily customize your AMP settings anywhere, anytime! Free mobile app that allows you to wirelessly update firmware and customize preferences for your AMP Series helmet communication system. Includes interactive tutorials for all AMP features. Transfers easily between helmets and uses, with a wide range of available accessories. Our patented Advanced Beamforming Technology® allows the concealed dual-microphone to capture and extract specific sounds, virtually eliminating all background noise. Intercom range is extended for each user added, so the more riders, the longer the range. Three speaker and microphone models to choose from. Industry’s widest array of speaker options from clear voice to powerful bass. Pulse Pro – Provides the best audio available and works with full, modular, and open face helmets. Boost Pro – One step up from Boost Plus, designed for both modular and open face helmets. Boost Plus – Exclusive concealed microphone technology paired with hi-def audio. Enjoy the ultimate convenience with the CLEARLink mobile app from UCLEAR Digital. For use with the AMP helmet audio and communication systems, the industry-exclusive mobile app allows users to update firmware and customize preferences wirelessly from any Smartphone or tablet. Click below to download now.